CLAUDIUS APOLLINARIS, Bishop of Hierapolis in Phrygia, was one of the most illustrious prelates of the second age. Notwithstanding the great encomiums bestowed on him by Eusebius, St. Jerome, Theodoret, and ethers, but little is known of his actions; and. his writings,which then were held in great esteem, seem now to be all lost. He wrote many able treatises against the heretics, and pointed out, as St. Jerome testifies, from what philosophical sect each heresy derived its errors. Nothing rendered his name so illustrious, however, as his noble apology for the Christian religion which he addressed to the Emperor Marcus Aurelius, about the year 175, soon after the miraculous victory that prince had obtained over the Quadi by the prayers of the Christians. 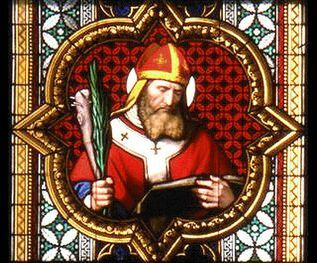 St. Apollinaris reminded the emperor of the benefit he had received from God through the prayers of his Christian subjects, and implored protection for them against the persecution of the pagans. Marcus Aurelius published an edict in which he forbade any one, under pain of death, to accuse a Christian on account of his religion; by a strange inconsistency, he had not the courage to abolish the laws then in force against the Christians, and, as a consequence, many of them suffered martyrdom, though their accusers were also put to death. The date of St. Apollinaris' death is not known; the Roman Martyrology mentions him on the 8th of January.